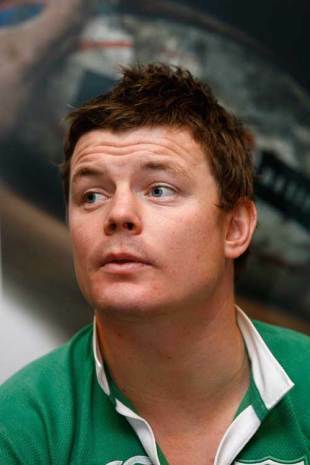 Brian O'Driscoll revealed Ireland refused to be intimidated by Argentina in today's 17-3 victory after being criticised for their capitulation to New Zealand. The Irish guaranteed inclusion among the second seeds for next month's 2011 World Cup draw by edging a fractious encounter at Croke Park. Tempers frequently boiled over and skipper O'Driscoll revealed his side wanted to silence suggestions they had surrendered too easily to the All Blacks last weekend. "We weren't going to take a backwards step. When teams come to Croke Park we're not here to be bullied or shoved around," he said. "We didn't initiate too much but if anything was going on then we certainly weren't backing down. That's how it has to be. "It showed great camaraderie that everyone was there for one another. No one was going to get picked on. If there were any scuffles then there were always guys there on your shoulder to help out. It was important that we looked after one another. "We mentioned during the week that these game are physical and that we wouldn't be pushed around. It's in our nature to be hard, rugged people and it hurt us a little bit that certain factions of the media said we were pushed around by the All Blacks. "Throughout the years there's been so much at stake every time we've played them, usually in World Cups or looking for revenge because of what's happened at a World Cup. The rankings issue meant there was a lot at stake this time too. There was huge honesty from us. "It was a brutal game but sometimes you just have to roll your sleeves up and getting stuck in." Ireland's triumph was marred by the late withdrawal of flanker David Wallace because of a neck injury, but coach Declan Kidney revealed the damage incurred was minor. "There will be soft tissue damage but he'll be okay. You have to be careful with an injury like that," said Kidney. Argentina were hit by the late withdrawal of star playmaker Juan Martin Hernandez to a hamstring problem. Santiago Phelan, the Pumas' coach, revealed Hernandez had been carrying the injury all week but hoped to be ready to face Ireland. "During the warm up he pulled out - it was impossible for him to kick and we decided not to play him," he said. "The decision was made half an hour before kick-off. We knew about the injury but we worked hard to get him fit for the game. Yesterday he was okay but in the warm up he suffered a twinge." Argentina captain Juan Martín Fernández Lobbe admitted losing Hernandez was a major blow but was impressed with his replacement Santiago Fernandez, who was making his first start. "Fernandez had an amazing game. He took the match into his hands and we're very proud of him," he said. "But of course Hernandez is a top player and everyone knows how great a fly-half he is."